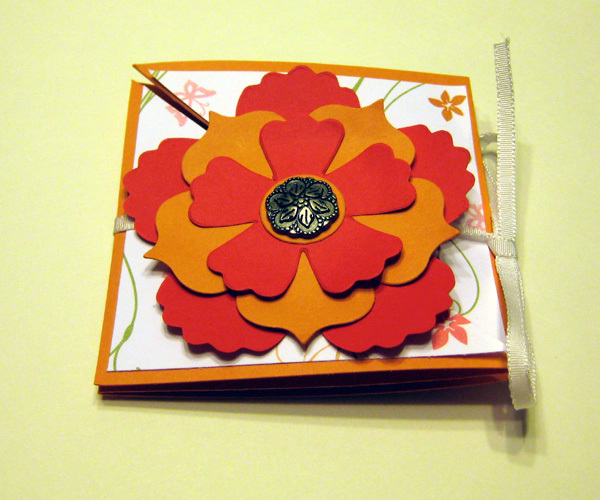 I created this card for a swap this weekend at a fantastic event organized by my uplines. Our annual Spring into Stamping is a day full of speakers, demonstrations, make-n-takes and swapping that is like our own mini-convention right here at home! I look forward to it every year. 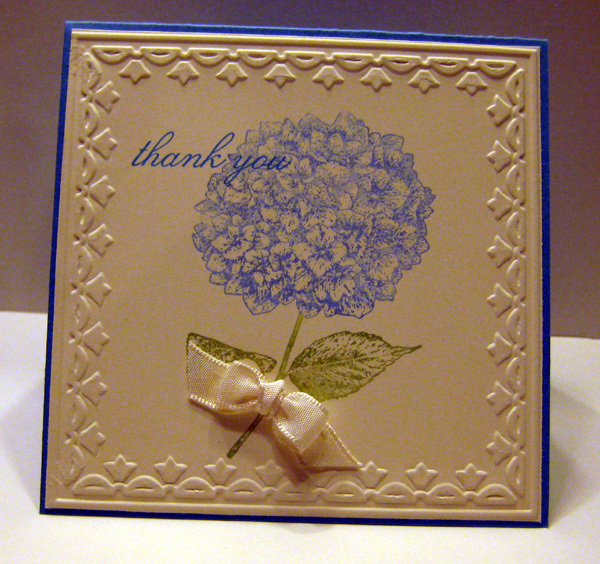 Yet another perk of being a Stampin' Up! demonstrator. Visit my webpage for more information about joining my team, and you can join us next time! Shanon is having a workshop this afternoon and here is part of her hostess gift. I will credit Julie Davison with the idea as I think I came home from a meeting and recreated this project of hers. I used the scallop circle Big Shot die and assorted punches, filled it with M & Ms, and it's ready to go. 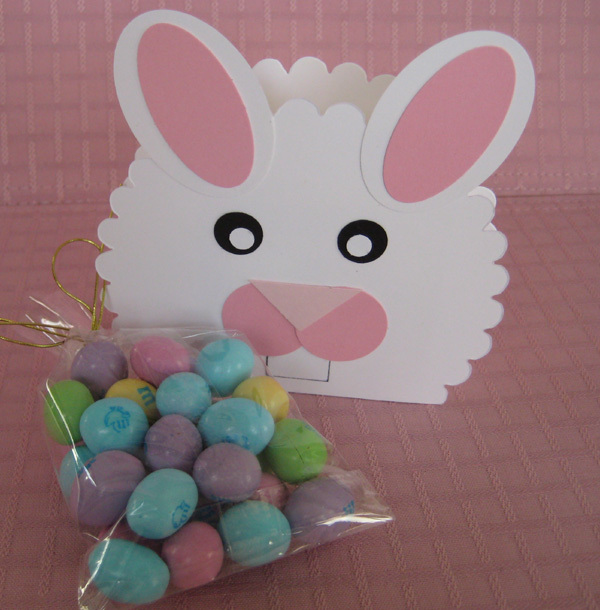 I might have to make a couple more for Easter treats for my niece and nephew. 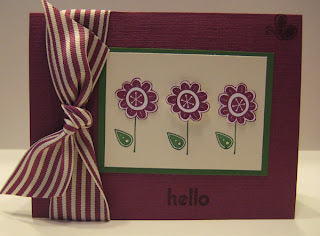 I wanted to use the new Fun Flowers die in stamp club, and I thought it would be perfect on a 3-D sort of project. So after talking with Cindy about this fold, I figured why not combine the two. It went together quickly and the beauty of doing alternating colors on the flower is that your "scraps" create a second flower for you to make another one! 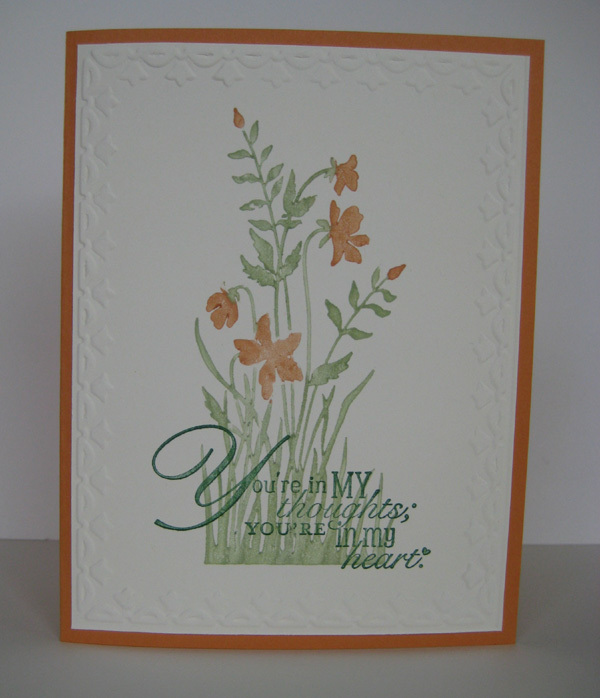 I used Sunny Garden Designer Series Paper, but you could just as easily use a solid color of cardstock or stamp a background. The center of the flower is an antique brad. 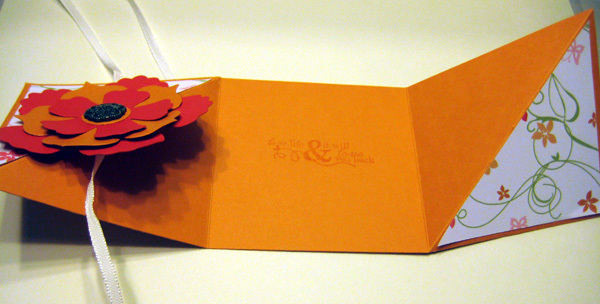 To create a square tulip frame, start with a 4 1/8” square of cardstock. Run it through the Big Shot like you normally would. Then flip your cardstock around 90 degrees and move embossed cardstock around until lined up in already embossed areas. You can also tell by the look through the plastic. Run it back through the Big Shot half way only. 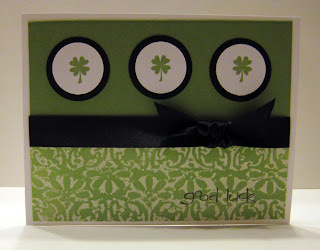 Isn't that a great way to get double duty out of your Framed Tulips Embossing Folder? The bow was made using a fork - yes, you read that right, a fork! Here are the directions but you might prefer seeing it. Just Google fork bows and you should find something pretty easily. Fold ribbon in half and wrap around entire fork with tails to the right. Pull bottom ribbon around to the front and tuck down through center tines below ribbon. Wrap remaining tail around to the front and tuck down through center tines above ribbon. Tie one time in the back and pull off of fork. Who wouldn't like to sink their teeth into this to do list? 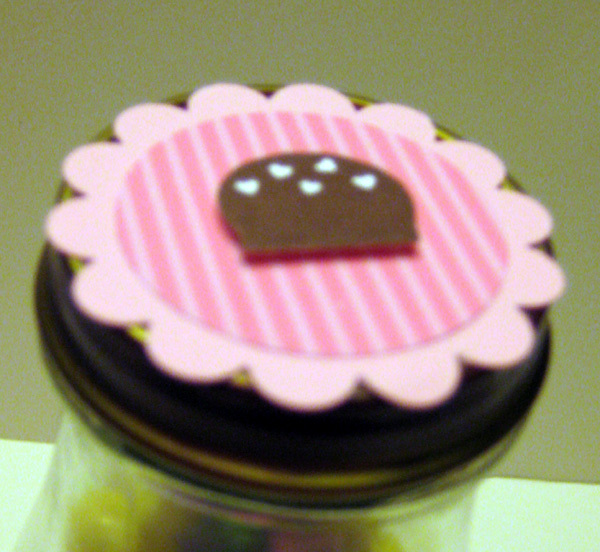 We made these jars in stamp club and used one of my favorite sets from the Occasions Mini catalog, Eat Chocolate. Simply remove the label from a Starbucks Frappuccino Coffe Drink bottle. 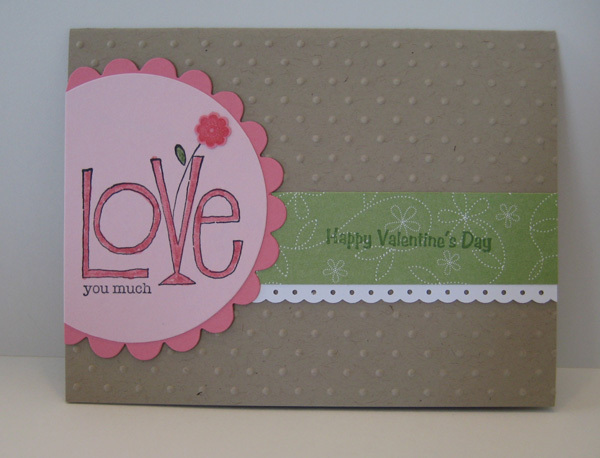 Attach your stamped label with Sticky Strip and decorate the lid. 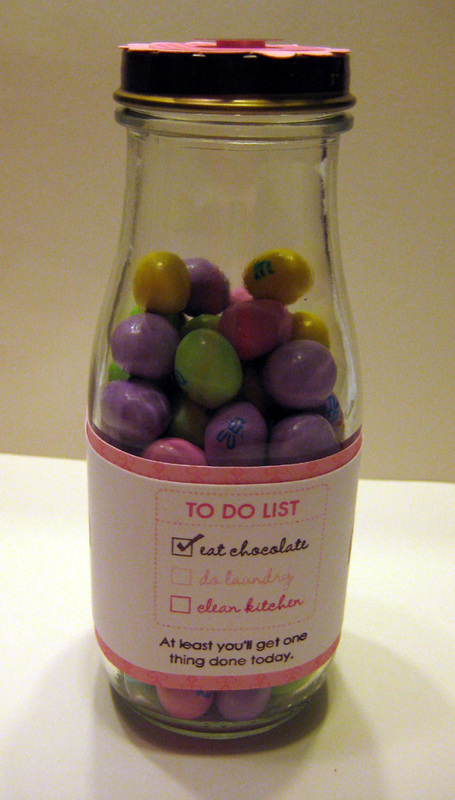 If you go with a pink and brown theme like this jar, there's no need to do anything but cover the top of the lid. 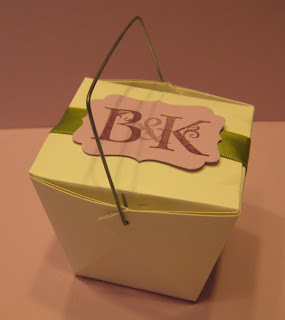 If you have a different color scheme, you might want to run a piece of grosgrain ribbon around to cover the edge of the lid. Fill it with candy and you have an instant treat container! This St. Patrick's Day card features a technique that is new to me. 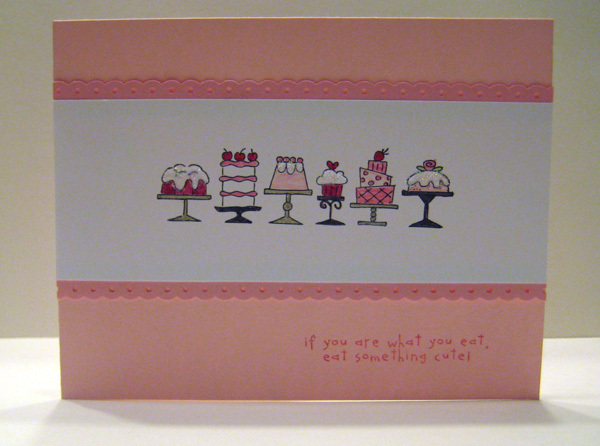 It's a type of emboss resist that we did using an embossing folder. Emboss a piece of waxed paper in the embossing folder with your Big Shot. Then sandwich the piece of embossed waxed paper between two pieces of glossy cardstock (glossy side in) and iron between parchment paper. Don't forget the parchment paper... it is used to protect your iron. I ironed with a dry iron on a cotton setting for about 10 seconds. When you are done, the wax will be left on your glossy cardstock and you can then brayer over it with your color and you've got an awesome background piece to work with. 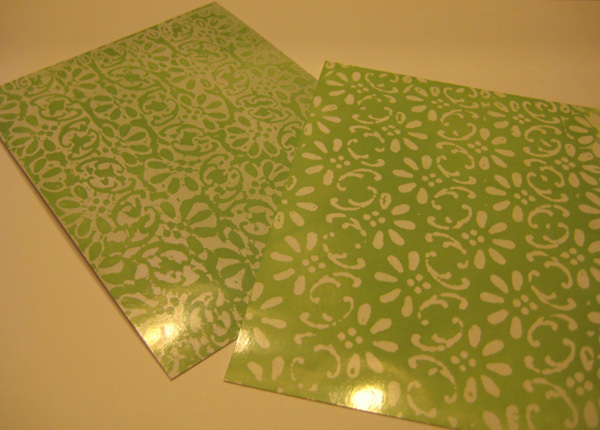 Because you are sandwiching the waxed paper between two pieces of cardstock, you actually have two very different looking pieces to work with. And on this card, I only used half of one sheet which yields 4 cards. The stamps are from the Sale-a-bration set So Happy For You. 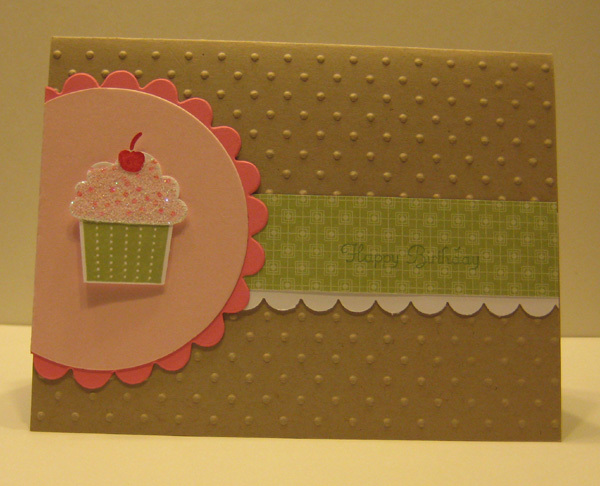 Here's another card using the same layout and color combination from the birthday card that I copied from Kim. It was just such a nice layout and I had new Big Shot dies to use so I designed this as a possible Valentine's Day card. 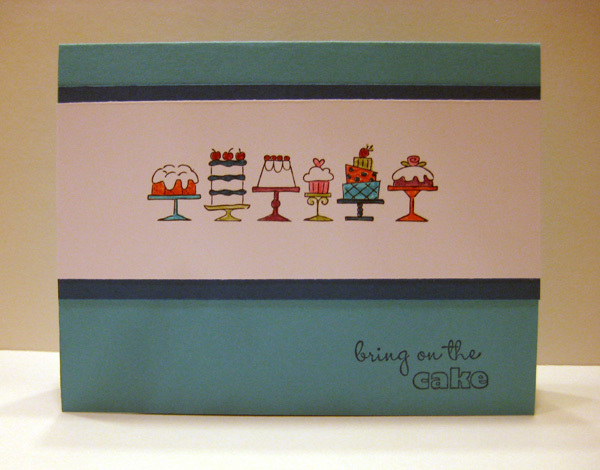 Here's the last of my birthday stamp-a-stack cards. 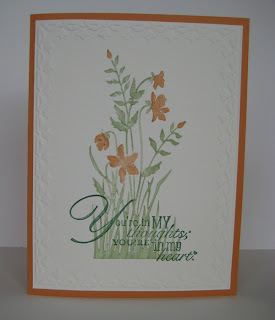 This one came from a swap I did with my group of fellow demonstrators and was made by my upline Kim Peck. I changed very little and knew the moment I took it out of the envelope I would be using this with my group of ladies. Thanks Kim! Last weekend's stamp-a-stacks were birthday themed so here is the masculine card we did. I kept it pretty simple with no accessories of any kind... which was hard for me to do! But the Marina Mist, Chocolate Chip and Crumb Cake were a good color combination to work with, and I liked how these turned out! Here is another version of the cupcake card we did last weekend at my stamp-a-stack. 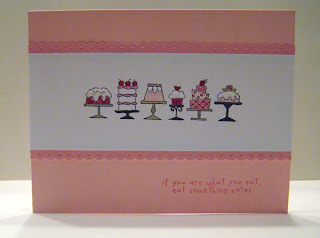 I resisted the urge to do an all pink card for the stamp-a-stack since one of our other cards had a lot of pink in it, but I really liked how this version turned out. 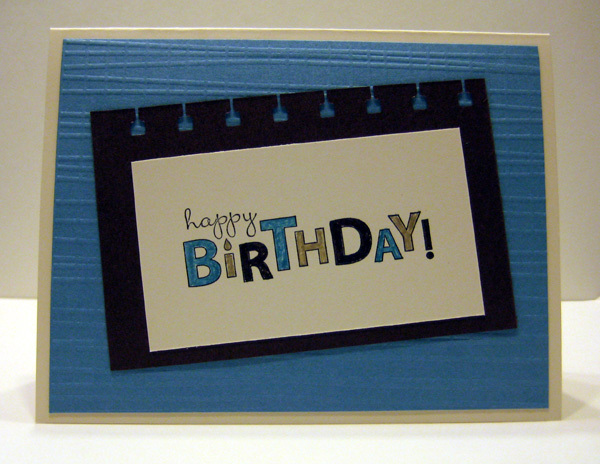 The Tempting Turquoise we did use made it easy to tweak and turn it into a boy card. So one card done three ways! A good friend of mine will be getting married soon, and she has asked me to help her figure out favor boxes. So I grabbed my catalog and went right to the Lovely Letters alphabet set. I used a scrap of retired Pale Plum cardstock because it is pretty close to our wisteria bridesmaid dresses and stamped it with Perfect Plum. Stamping off once before stamping the ampersand allowed me to overlap the letters so everything would fit on the Decorative Label Punch without seeming too crowded. I think the Old Olive ribbon works well for her mossy green accent color. 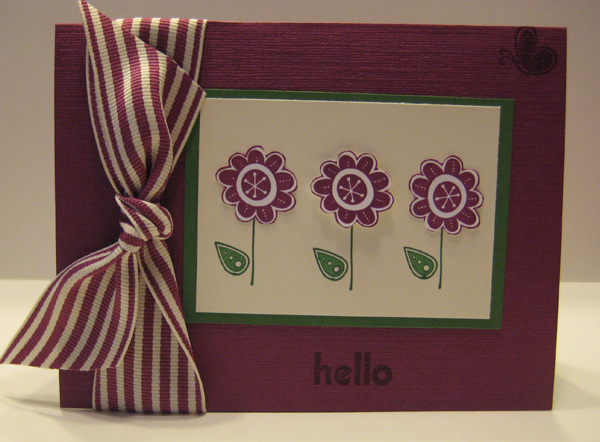 Sale-a-bration is such a great time for stampers! Here's a card I made with Hello Again. It is one of the many sets you can get for free during Sale-a-bration! 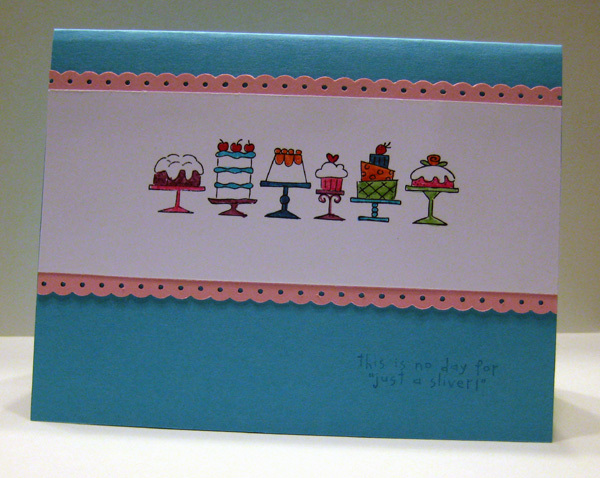 This is No Day for "Just a Sliver"
We are doing birthday cards this weekend at my stamp-a-stacks. 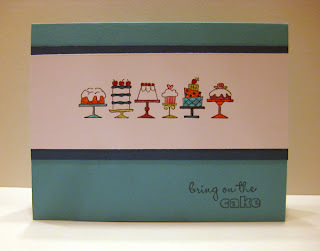 Here's one we will be doing and it features that adorable level 1 hostess set, Birthday Bakery. Join us if you are local!